Will new regulations mean more costly problems for boaters?. Dealing with ethanol-blended gasoline is a constant struggle for boaters, but a few preventative measures can help avoid hassle and engine damage. 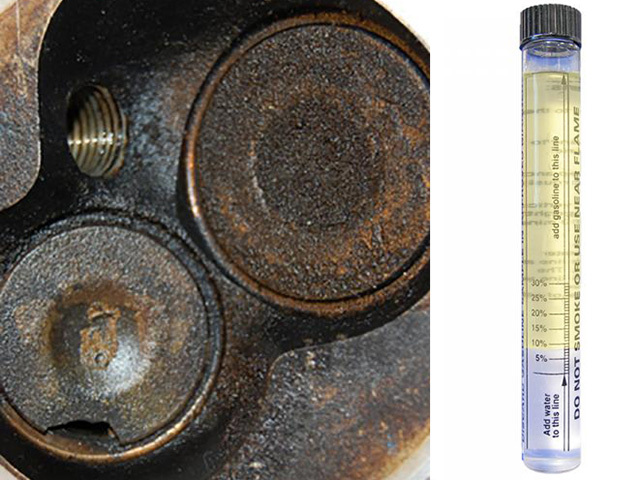 Ethanol-blended fuel can break down fuel system components and send debris into your engine's combustion chamber, causing damage (left). The photo on the right illustrates phase separation, which occurs when ethanol absorbs just one half of one percent water by volume. The ethanol bonds with the water and sinks to the bottom of a fuel tank where the engine fuel pickup is located. A 10-micron fuel/water separating filter­ installed in the fuel line between the tank and the outboard will filter out any debris that ethanol might loosen in the tank, and it will separate out and collect any water from the fuel. Unless you haven't put fuel in your car in the past ten years, you're probably familiar with the term E10. It refers to the 10 percent ethanol that is blended into the gasoline you buy at the pump. If you've owned an outboard-powered boat during that same time period, you are far more familiar with E10 than your over-the-road counterparts. Ethanol is a fermented and refined grain alcohol that is denatured and then blended with gasoline. It initially found its way into the nation’s fuel supply as a replacement for a chemical additive called MTBE, which was used to increase octane and reduce emissions. After years of use, the EPA determined that MTBE was harmful to the environment, and the hunt for a replacement began. Domestically manufactured ethanol replaced MTBE, and was also promoted as a way to reduce the nation’s dependency on foreign oil. However, the use of ethanol in fuel came with a host of problems for marine engines and fuel systems. Ethanol is a form of alcohol and alcohol is a highly efficient solvent. So when it is introduced into older metal fuel tanks, it gradually begins to break down accumulated sediments and washes them into the fuel system. Those same properties can cause resins and fillers used to make fiberglass fuel tanks to leach out into the fuel system where they adhere to internal engine parts. 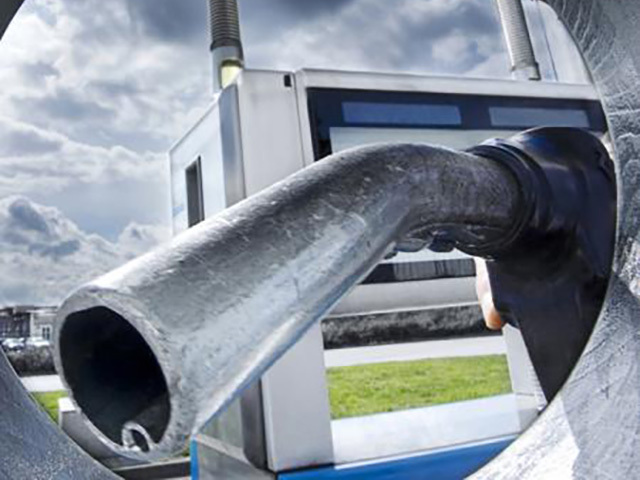 Ethanol-blended fuel can also be responsible for the decomposition of rubber gaskets and fuel lines that heretofore had been approved for use in gasoline fuel systems. Boat and engine manufacturers took on the challenge of upgrading their products to avoid these problems going forward, and have done an admirable job. But even though most of the problems with E10-blended fuels have been accounted for by outboard manufacturers, there are still some issues that are inherent to the product that continue to plague boaters. Ethanol is hygroscopic, which means it absorbs water from the air. Boats live in a moisture- and humidity-rich environment, and boat fuel systems are vented to the atmosphere. Without venting, an outboard’s fuel pump would not be able to draw fuel from the tank. Venting allows outside air to enter the tank along with moisture and humidity where it contacts the ethanol in the gas. 1. Be sure to use a 10-micron fuel/water separating filter­—with proper flow rating for the engine—installed in the fuel line between the tank and the outboard. This will filter out any debris that ethanol might loosen in the tank, and it will separate out and collect any water from the fuel. 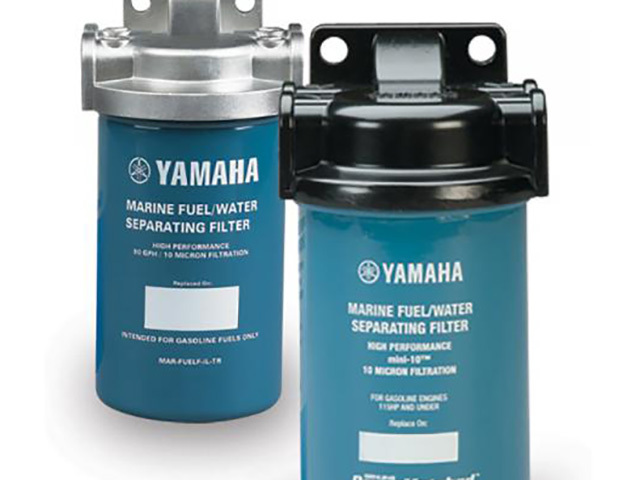 (Yamaha offers high-quality canister filters with large water collecting reservoirs for their outboards.) Filters should be replaced every 100 hours of operation or checked/replaced more frequently if the presence of significant water is found. 3. Add Yamalube Ring Free Plus internal engine cleaner to every tank of fuel. It will do the job of keeping your fuel system clean and corrosion free. The problems created by the initial introduction of ethanol into the fuel supply were widespread and costly to both individuals and the marine industry. The increase to 15 percent wll have far-reaching consequences. “We strongly urge consumers and members of the marine industry to make their voices heard and stop the EPA from going forward with a plan to increase the amount of ethanol in the fuel supply. They can do so by contacting the EPA—or their Congressman/Senator—directly over concerns that higher ethanol blends will have on their products or by accessing a number of marine advocacy websites such as the National Marine Manufacturers Association."